Symmetric division maintains stem cell lines and asymmetric division yields differentiated cells. Symmetric cell division of stem cells ensures that a constant pool of stem cells is available by giving rise to two identical daughter cells both endowed with stem cell properties. Asymmetric division of stem cells results in the production of only one stem cell and a progenitor cell with limited self-renewal potential. Progenitor cells that are produced via asymmetric cell division will go through additional rounds of cell division until they are terminally differentiated into a mature, specialized cell. Asymmetric division can be controlled by both intrinsic and extrinsic factors. Intrinsic factors involve differing amounts of cell-fate determinants being distributed into each daughter cell, while extrinsic factors involve interactions with neighboring cells and the micro and macro environment of the precursor cell. progenitor cell: a biological cell that, like a stem cell, has a tendency to differentiate into a specific type of cell, but is already more specific than a stem cell and is pushed to differentiate into its “target” cell. Stem cells are undifferentiated biological cells found in multicellular organisms, that can differentiate into specialized cells (asymmetric division) or can divide to produce more stem cells (symmetric division). In mammals, there are two broad types of stem cells: embryonic stem cells, which are isolated from the inner cell mass of blastocysts, and adult stem cells, which are found in various tissues. In adult organisms, stem cells and progenitor cells act as a repair system for the body by replenishing adult tissues. In a developing embryo, stem cells can differentiate into all of the specialized cells (including ectoderm, endoderm and mesoderm cells) but also maintain the normal turnover of regenerative organs, such as blood, skin, or intestinal tissues. The pathway that is taken to produced specialized cells included: the embryonic cells develop from totipotent cells, to pluripotent cells which undergo differentiation and become more specialized. The key component however, in the ability to maintain tissues is the ability to maintain a key of stem cells. Stem Cells: Pluripotent, embryonic stem cells originate as inner cell mass (ICM) cells within a blastocyst. These stem cells can become any tissue in the body, excluding a placenta. Only cells from an earlier stage of the embryo, known as the morula, are totipotent, able to become all tissues in the body and the extraembryonic placenta. There are three accessible sources of autologous adult stem cells in humans: (1) bone marrow, which requires extraction by harvesting (i.e., drilling into bone); (2) adipose tissue (lipid cells), which requires extraction by liposuction; and (3) blood, which requires extraction through apheresis (wherein blood is drawn from the donor, passed through a machine that extracts the stem cells, and returned to the donor). Stem cells can also be taken from umbilical cord blood just after birth. Of all the stem cell types, autologous harvesting involves the least risk. By definition, autologous cells are obtained from one’s own body, just as one may bank his or her own blood for elective surgical procedures. Highly plastic adult stem cells are routinely used in medical therapies, for example in bone marrow transplantation. Stem cells can now be artificially grown and differentiated into specialized cell types with characteristics consistent with muscle or nerve cells through cell culture. Embryonic cell lines and autologous embryonic stem cells generated through therapeutic cloning have also been proposed as promising candidates for future therapies. To ensure self-renewal, stem cells undergo two types of cell division: symmetric and asymmetric. Symmetric division gives rise to two identical daughter cells both endowed with stem cell properties. Asymmetric division, on the other hand, produces only one stem cell and a progenitor cell with limited self-renewal potential. Progenitors can go through several rounds of cell division themselves before terminally differentiating into a mature cell.. It is possible that the molecular distinction between symmetric and asymmetric division lies in differential segregation of cell membrane proteins between the daughter cells. An alternative theory is that stem cells remain undifferentiated due to environmental cues in their particular niche. Stem cells differentiate when they leave that niche or no longer receive those signals. Symmetric and Asymmetric Division: This diagram illustrates stem cell division and differentiation, through the processes of (1) symmetric stem cell division, (2) asymmetric stem cell division, (3) progenitor division, and (4) terminal differentiation. Stem cells are indicated by (A), progenitor cells by (B), and differentiated cells by (C). An asymmetric cell division produces two daughter cells with different cellular fates. This is in contrast to normal symmetric cell divisions, which give rise to daughter cells of equivalent fates. Notably, stem cells divide asymmetrically to give rise to two distinct daughter cells: one copy of the original stem cell as well as a second daughter programmed to differentiate into a non-stem cell fate. In principle, there are two mechanisms by which distinct properties may be conferred on the daughters of a dividing cell. In one, the daughter cells are initially equivalent but a difference is induced by signaling between the cells, from surrounding cells, or from the precursor cell. This mechanism is known as extrinsic asymmetric cell division. Extrinsic factors involve interactions with neighboring cells and the micro and macro environment of the precursor cell. In the second mechanism, the prospective daughter cells are inherently different at the time of division of the mother cell. Because this latter mechanism does not depend on interactions of cells with each other or with their environment, it must rely on intrinsic asymmetry. The term asymmetric cell division usually refers to such intrinsic asymmetric divisions. Intrinsic factors generally involve differing amounts of cell-fate determinants being distributed into each daughter cell. Animals are made up of a vast number of distinct cell types. During development, the zygote undergoes many cell divisions that give rise to various cell types, including embryonic stem cells. Asymmetric divisions of these embryonic cells gives rise to one cell of the same potency (self-renewal), and another that may be of the same potency or stimulated to further differentiate into specialized cell types such as neurons. Asymmetric division of stem cells plays a key role in development by allowing for the differentiation of a subset of daughter cells while maintaining stem cell pluripotency. Since it can be controlled by both intrinsic and extrinsic factors, upon delineating these particular factors it may be possible to use this knowledge in applications of tissue and whole organ generation. Cellular differentiation occurs so cells can specialize for different functions within an organism. The three major cell types in the mammalian body include germ cells (which develop into gametes), somatic cells ( diploid cells that develop into a majority of the human body) and stem cells (cells that can divide indefinitely). In human development, the inner cell mass exhibits the ability to differentiate and form all tissues of the body; however, they cannot form an organism. The various types of stem and progenitor cells included in the body that will differentiate to develop more specialized cells includes: hematopoietic stem cells, mesenchymal stem cells, epithelial stem cells and muscle satellite cells. To develop a multicellular oragnisms, cells must differentiate to specialize for different functions. To develop a multicellular organisms, cells must differentiate to specialize for different functions. Three basic categories of cells make up the mammalian body: germ cells, somatic cells, and stem cells. Each of the approximately 100 trillion cells in an adult human has its own copy or copies of the genome except certain cell types, such as red blood cells, that lack nuclei in their fully differentiated state. Most cells are diploid; they have two copies of each chromosome. The process of cellular differentiation is regulated by transcription factors and growth factors, and results in expression or inhibition of various genes between the cell types, thereby resulting in varying proteomes between cell types. The variation in proteomes between cell types is what drives differentiation and thus, specialization of cells. The ability of transcription factors to control whether a gene will be transcribed or not that contributes to specialization and growth factors to aid in the division process are key components of cell differentiation. Cell Differentiation: Mechanics of cellular differentiation can be controlled by growth factors which can induce cell division. In asymetric cell division the cell will be induced to differentiate into a specialized cell and the growth factors will work in tandem. Somatic cells are diploid cells that make up most of the human body, such as the skin and muscle. Germ cells are any line of cells that give rise to gametes—eggs and sperm—and thus are continuous through the generations. Stem cells, on the other hand, have the ability to divide for indefinite periods and to give rise to specialized cells. They are best described in the context of normal human development. Development begins when a sperm fertilizes an egg and creates a single cell that has the potential to form an entire organism. In the first hours after fertilization, this cell divides into identical cells. In humans, approximately four days after fertilization and after several cycles of cell division, these cells begin to specialize, forming a hollow sphere of cells, called a blastocyst. The blastocyst has an outer layer of cells, and inside this hollow sphere, there is a cluster of cells called the inner cell mass. The cells of the inner cell mass go on to form virtually all of the tissues of the human body. Although the cells of the inner cell mass can form virtually every type of cell found in the human body, they cannot form an organism. These cells are referred to as pluripotent. A pathway that is guided by the cell adhesion molecules is created as the cellular blastomere differentiates from the single-layered blastula to the three primary layers of germ cells in mammals, namely the ectoderm, mesoderm and endoderm (listed from most distal, or exterior, to the most proximal, or interior). The ectoderm ends up forming the skin and the nervous system, the mesoderm forms the bones and muscular tissue, and the endoderm forms the internal organ tissues. Cellular differentiation, a necessary process in development and maintenance of multicellularity, is regulated by transcription factors. Different types of stem cells exhibit varying abilities to differentiate into specialized cells (from the most unlimited stem cell to the most restricted): totipotent, pluripotent, multipotent to oligopotent. 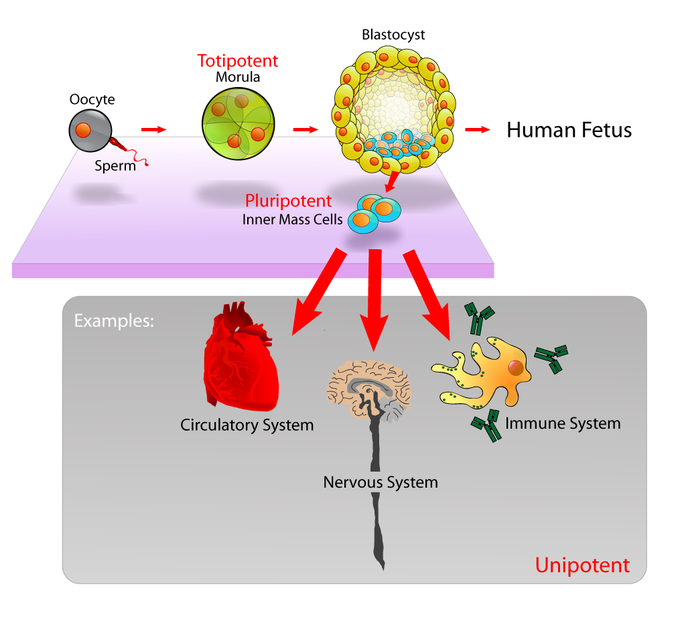 Totipotent cells have the potential to differentiate into any of the cells needed to enable an organism to grow and develop; pluripotent cells have the potential to differentiate into any type of human tissue but cannot support the full development of an organism. A multipotent stem cell has the potential to differentiate into different types of cells within a given cell lineage or small number of lineages, while an oligopotent stem cell is limited to becoming one of a few different cell types. The process of cellular differentiation is under strict regulation by transcription factors which can either activate or repress expression of genes that will affect the proteome of the cell and thus, provide the necessary components it needs to become a specialized cell. All cells contain the same complement of DNA, or genome, but once differentiation occurs, it is the changes in the proteome that will distinguish one cell type from another. How does a complex organism such as a human develop from a single cell—a fertilized egg—into the vast array of cell types such as nerve cells, muscle cells, and epithelial cells that characterize the adult? Throughout development and adulthood, the process of cellular differentiation leads cells to assume their final morphology and physiology. Differentiation is the process by which unspecialized cells become specialized to carry out distinct functions. A stem cell is an unspecialized cell that can divide without limit as needed and can, under specific conditions, differentiate into specialized cells. Stem cells are divided into several categories according to their potential to differentiate. The first embryonic cells that arise from the division of the zygote are the ultimate stem cells; these stems cells are described as totipotent because they have the potential to differentiate into any of the cells needed to enable an organism to grow and develop. The embryonic cells that develop from totipotent stem cells and are precursors to the fundamental tissue layers of the embryo are classified as pluripotent. A pluripotent stem cell is one that has the potential to differentiate into any type of human tissue but cannot support the full development of an organism. These cells then become slightly more specialized, and are referred to as multipotent cells. A multipotent stem cell has the potential to differentiate into different types of cells within a given cell lineage or small number of lineages, such as a red blood cell or white blood cell. Hematopoiesis: the differentiation of multipotent cells: The process of hematopoiesis involves the differentiation of multipotent cells into blood and immune cells. The multipotent hematopoietic stem cells give rise to many different cell types, including the cells of the immune system and red blood cells. Finally, multipotent cells can become further specialized oligopotent cells. An oligopotent stem cell is limited to becoming one of a few different cell types. In contrast, a unipotent cell is fully specialized and can only reproduce to generate more of its own specific cell type. Stem cells are unique in that they can also continually divide and regenerate new stem cells instead of further specializing. There are different stem cells present at different stages of a human’s life, including the embryonic stem cells of the embryo, fetal stem cells of the fetus, and adult stem cells in the adult. One type of adult stem cell is the epithelial stem cell, which gives rise to the keratinocytes (cells that produce keratin, the primary protein in nails and hair) in the multiple layers of epithelial cells in the epidermis of skin. Adult bone marrow has three distinct types of stem cells: hematopoietic stem cells, which give rise to red blood cells, white blood cells, and platelets; endothelial stem cells, which give rise to the endothelial cell types that line blood and lymph vessels; and mesenchymal stem cells, which give rise to the different types of muscle cells. When a cell differentiates (i.e., becomes more specialized), it may undertake major changes in its size, shape, metabolic activity, and overall function. Because all cells in the body, beginning with the fertilized egg, contain the same DNA, how do the different cell types come to be so different? The answer is analogous to a movie script. Different actors in a movie all read from the same script, but each one only reads their own part of the script. Similarly, all cells contain the same full complement of DNA, but each type of cell only “reads” the portions of DNA that are relevant to its own functioning. In other terms, each cell has the genome but will only express specific genes, thereby having unique proteomes. In biology, this is referred to as the unique genetic expression of each cell. In order for a cell to differentiate into its specialized form and function, it need only manipulate those genes (and thus those proteins) that will be expressed, and not those that will remain silent. The primary mechanism by which genes are turned “on” or “off” is through transcription factors. A transcription factor is one of a class of proteins that bind to specific genes on the DNA molecule and either promote or inhibit their transcription. The primary mechanism that determines which genes will be expressed and which ones will not is through the use of different transcription factor proteins, which bind to DNA and promote or hinder the transcription of different genes. Through the action of these transcription factors, cells specialize into one of hundreds of different cell types in the human body. Transcription Factors Regulate Gene Expression: While each body cell contains the organism’s entire genome, different cells regulate gene expression with the use of various transcription factors. Transcription factors are proteins that affect the binding of RNA polymerase to a particular gene on the DNA molecule. Animal bodies have three axes for symmetry (lateral-medial, dorsal-ventral and anterior-posterior) which are established in development. The three axes of the animal body are established in development via the expression of specific sets of genes that regulate which cells will develop into specific structures. During development, the dorsal cells are genetically programmed to develop into the notochord and define the axis. The neural tube can develop in two ways: primary or secondary neurulation, which are used by organisms in varying degrees to establish the neural tube that will develop into the central nervous system (brain and spinal cord). Specific patterns along the neural tube that are established via secretion and production of specific signaling molecules (such as Wnt, Shh, BMP and retinoic acid) play a key role in patterning the dorsal and ventral axes. During development, as the germ layers form, the ball of cells still retains its spherical shape. However, animal bodies have lateral-medial (left-right), dorsal-ventral (back-belly), and anterior-posterior (head-feet) axes. How are these established? In one of the most seminal experiments ever to be carried out in developmental biology, Spemann and Mangold took dorsal cells from one embryo and transplanted them into the belly region of another embryo. They found that the transplanted embryo now had two notochords: one at the dorsal site from the original cells and another at the transplanted site. This suggested that the dorsal cells were genetically programmed to form the notochord and define the axis. Since then, researchers have identified many genes that are responsible for axis formation. Mutations in these genes leads to the loss of symmetry required for organism development. Animal bodies have externally visible symmetry. However, the internal organs are not symmetric. For example, the heart is on the left side and the liver on the right. The formation of the central left-right axis is an important process during development. This internal asymmetry is established very early during development and involves many genes. Research is still ongoing to fully understand the developmental implications of these genes. Vertebrate Axis Formation: Animal bodies have three axes for symmetry:lateral-medial (left-right), dorsal-ventral (back-belly), and anterior-posterior (head-feet). In the developing chordate (including vertebrates), the neural tube is the embryo’s precursor to the central nervous system, which comprises the brain and spinal cord. The neural groove gradually deepens as the neural folds become elevated, and ultimately the folds meet and coalesce in the middle line and convert the groove into a closed tube, the neural tube or neural canal, the ectodermal wall of which forms the rudiment of the nervous system. The neural tube develops in two ways: primary neurulation and secondary neurulation. Primary neurulation divides the ectoderm into three cell types: the internally located neural tube, the externally located epidermis, and the neural crest cells, which develop in the region between the neural tube and epidermis but then migrate to new locations. Primary neurulation begins after the neural plate forms. The edges of the neural plate start to thicken and lift upward, forming the neural folds. The center of the neural plate remains grounded, allowing a U-shaped neural groove to form. This neural groove sets the boundary between the right and left sides of the embryo. The neural folds pinch in towards the midline of the embryo and fuse together to form the neural tube. In secondary neurulation, the cells of the neural plate form a cord-like structure that migrates inside the embryo and hollows to form the tube. Neural Tube Formation: The central region of the ectoderm forms the neural tube, which gives rise to the brain and the spinal cord. Each organism uses primary and secondary neurulation to varying degrees. Neurulation in fish proceeds only via the secondary form. In avian species the posterior regions of the tube develop using secondary neurulation and the anterior regions develop by primary neurulation. In mammals, secondary neurulation begins around the 35th somite. Mammalian neural tubes close in the head in the opposite order that they close in the trunk. In the head, neural crest cells migrate, the neural tube closes, and the overlying ectoderm closes. In the trunk, overlying ectoderm closes, the neural tube closes and neural crest cells migrate. Four neural tube subdivisions eventually develop into distinct regions of the central nervous system by the division of neuroepithelial cells: the prosencephalon, the mesencephalon, the rhombencephalon and the spinal cord. The prosencephalon further goes on to develop into the telencephalon (the forebrain or cerebrum) and the diencephalon (the optic vesicles and hypothalamus). The mesencephalon develops into the midbrain. The rhombencephalon develops into the metencephalon (the pons and cerebellum) and the myelencephalon (the medulla oblongata). For a short time, the neural tube is open both cranially and caudally. These openings, called neuropores, close during the fourth week in the human. Improper closure of the neuropores can result in neural tube defects such as anencephaly or spina bifida. The dorsal part of the neural tube contains the alar plate, which is primarily associated with sensation. The ventral part of the neural tube contains the basal plate, which is primarily associated with motor (i.e., muscle) control. The neural tube patterns along the dorsal-ventral axis establish defined compartments of neural progenitor cells that lead to distinct classes of neurons. This patterning occurs early in development and results from the activity of several secreted signaling molecules. Sonic hedgehog (Shh) is a key player in patterning the ventral axis, while Bone morphogenic proteins (Bmp) and Wnt family members play an important role in patterning the dorsal axis. Other factors shown to provide positional information to the neural progenitor cells include Fibroblast growth factors (FGF) and Retinoic Acid. Retinoic acid is required ventrally along with Shh to induce Pax6 and Olig2 during differentiation of motor neurons. Three main ventral cell types are established during early neural tube development: the floor plate cells, which form at the ventral midline during the neural fold stage; as well as the more dorsally located motor neurons and interneurons. These cell types are specified by the secretion of Shh from the notochord (located ventrally to the neural tube), and later from the floor plate cells. Shh acts as a morphogen, meaning that it acts in a concentration-dependent manner to specify cell types as it moves further from its source. The different combinations of expression of transcription factors along the dorsal-ventral axis of the neural tube are responsible for creating the identity of the neuronal progenitor cells. During development it is critical that specific gene expression patterns are established to signal and differentiate the cells appropriately. Organogenesis results in the formation of the various organs in the body; however it will only occur if specific sets of genes are expressed to determine ultimate cell type. The ability of specific cells to migrate to the the edge of the ectoderm is highly regulated by specific gene expression and allows for differentiation into epidermal cells; in contrast, the cells which remain in the center will develop into the neural plate. The expression of specific sets of genes will also regulate the reorganization of the mesoderm into distinct groups of cells, called somites, which develop into the ribs, lungs, spine muscle and notochord. Gastrulation leads to the formation of the three germ layers that give rise, during further development, to the different organs in the animal body. This process, known as organogenesis, is characterized by rapid and precise movements of the cells within the embryo. Organs form from the germ layers through the process of differentiation. During differentiation, the embryonic stem cells express specific sets of genes which will determine their ultimate cell type. For example, some cells in the ectoderm (the outer tissue layer of the embryo) will express the genes specific to skin cells. As a result, these cells will differentiate into epidermal cells. The process of differentiation is regulated by cellular signaling cascades. Scientists study organogenesis extensively in the lab in fruit flies (Drosophila) and the nematode Caenorhabditis elegans. Drosophila have segments along their bodies, and the patterning associated with the segment formation has allowed scientists to study which genes play important roles in organogenesis along the length of the embryo at different time points. The nematode C.elegans has roughly 1000 somatic cells and scientists have studied the fate of each of these cells during their development in the nematode life cycle. There is little variation in patterns of cell lineage between individuals, unlike in mammals where cell development from the embryo is dependent on cellular cues. In vertebrates, one of the primary steps during organogenesis is the formation of the neural system. The ectoderm forms epithelial cells and tissues, as well as neuronal tissues. During the formation of the neural system, special signaling molecules called growth factors signal some cells at the edge of the ectoderm to become epidermis cells. The remaining cells in the center form the neural plate. If the signaling by growth factors were disrupted, then the entire ectoderm would differentiate into neural tissue. The neural plate undergoes a series of cell movements where it rolls up and forms a tube called the neural tube. In further development, the neural tube will give rise to the brain and the spinal cord. The mesoderm that lies on either side of the vertebrate neural tube will develop into the various connective tissues of the animal body. A spatial pattern of gene expression reorganizes the mesoderm into groups of cells called somites with spaces between them. The somites will further develop into the ribs, lungs, and segmental (spine) muscle. The mesoderm also forms a structure called the notochord, which is rod-shaped and forms the central axis of the animal body. Somites: In this five-week old human embryo, somites are segments along the length of the body. Cell migration is necessary for development and maintenance of multicellularity, and occurs through varying mechanisms. The disruption or dysfunction of cell migration processes can lead to formation of various diseases such as metastasis, tumor formation and vascular disease. In prokaryotic organisms, and some eukaryotic cells such as sperm cells, cell migration occurs via the use of a cilia or flagella to propel forward. In eukaryotic organisms, cell migration is a much more complex process and can include, but is not excluded to, changes in the cytoskeleton, motor proteins, blebbing, and cytoplasmic displacement; it involves both external and internal signals that mediate these processes. Cell migration is a central process in the development and maintenance of multicellular organisms. Processes such as tissue formation during embryonic development, wound healing, and immune responses, all require the orchestrated movement of cells in particular directions to specific locations. Errors during this process have serious consequences, including intellectual disability, vascular disease, tumor formation and metastasis. An understanding of the mechanism by which cells migrate may lead to the development of novel therapeutic strategies for controlling, for example, invasive tumor cells. Cells often migrate in response to specific external signals, including chemical signals and mechanical signals. Due to a highly viscous environment, cells need to permanently produce forces in order to move. Cells achieve active movement by very different mechanisms. Many less complex prokaryotic organisms (and sperm cells) use flagella or cilia to propel themselves. Eukaryotic cell migration typically is far more complex and can consist of combinations of different migration mechanisms. It generally involves drastic changes in cell shape which are driven by the cytoskeleton, for instance a series of contractions and expansions due to cytoplasmic displacement. Two very distinct migration scenarios are crawling motion (most commonly studied) and blebbing motility. The migration of cultured cells attached to a surface is commonly studied using microscopy. As cell movement is very slow (only a few µm/minute), time-lapse microscopy videos are recorded of the migrating cells to speed up the movement. Such videos reveal that the leading cell front is very active with a characteristic behavior of successive contractions and expansions. It is generally accepted that the leading front is the main motor that pulls the cell forward. Cell Migration: Phase images of BSC 1 cells migrating in a scratch assay in the absence of serum over a period of 15 hours. The processes underlying mammalian cell migration are believed to be consistent with those of (non-spermatozoic) locomotion. Observations in common include cytoplasmic displacement at the leading front and laminar removal of dorsally-accumulated debris toward trailing end. The latter feature is most easily observed when aggregates of a surface molecule are cross-linked with a fluorescent antibody or when small beads become artificially bound to the front of the cell. Other eukaryotic cells are observed to migrate similarly. The amoeba Dictyostelium discoideum is useful to researchers because they consistently exhibit chemotaxis in response to cyclic AMP; they move more quickly than cultured mammalian cells; and they have a haploid genome that simplifies the process of connecting a particular gene product with its effect on cellular behavior. Programmed cell death describes the death of a cell through a highly regulated process, and serves many functions in an organism. Programmed cell death can provide an advantage to an organism during development, for instance by maintaining homeostasis and protection against potentially disruptive issues which may arise during the life of a cell. Apoptosis is a process of programmed cell death that is regulated by numerous biochemical events and appears to be genetically mediated. Autophagy is a process of programmed cell death that is characterized as a catabolic process via formation of an autophagolysosome which degrades damaged cellular contents. Necrosis occurs when cellular death is caused by external factors and is characterized as an alternate form of programmed cell death, called necroptosis. Programmed cell-death (or PCD) is death of a cell in any form, mediated by an intracellular program. PCD is carried out in a regulated process, which usually confers advantage during an organism’s life-cycle. For example, the differentiation of fingers and toes in a developing human embryo occurs because cells between the fingers apoptose, or die; the result is that the digits are separate. PCD serves fundamental functions during both plant and metazoa (multicellular animal) tissue development. Apoptosis and autophagy are both forms of PCD, but necrosis is a non-physiological process that occurs as a result of infection or injury. Apoptosis is the process of PCD that may occur in multicellular organisms. Biochemical events lead to characteristic cell changes ( morphology ) and death. These changes include blebbing, cell shrinkage, nuclear fragmentation, chromatin condensation, and chromosomal DNA fragmentation. There appears to be some variation in the morphology and indeed the biochemistry of these “suicide” pathways. Some tread the path of apoptosis, while others follow a more generalized pathway to deletion; however both are usually genetically and synthetically motivated. There is some evidence that certain symptoms of apoptosis, such as endonuclease activation, can be spuriously induced without engaging a genetic cascade; however, it is presumed that true apoptosis and PCD must be genetically mediated. It is also becoming clear that mitosis (the division of the cell nucleus) and apoptosis are linked in some way, and that the balance achieved depends on signals received from appropriate growth or survival factors. When a cell is damaged, superfluous, or potentially dangerous to an organism, a cell can initiate a mechanism to trigger apoptosis. Apoptosis allows a cell to die in a controlled manner that prevents the release of potentially damaging molecules from inside the cell. There are many internal checkpoints that monitor a cell’s health; if abnormalities are observed, a cell can spontaneously initiate the process of apoptosis. However, in some cases, such as a viral infection or uncontrolled cell division due to cancer, the cell’s normal checks and balances fail. Apoptosis can also be initiated via external signaling. For example, most normal animal cells have receptors that interact with the extracellular matrix, a network of glycoproteins that provides structural support for cells in an organism. The binding of cellular receptors to the extracellular matrix initiates a signaling cascade within the cell. However, if the cell moves away from the extracellular matrix, the signaling ceases, and the cell undergoes apoptosis. This system keeps cells from traveling through the body and proliferating out of control, as happens with tumor cells that metastasize. 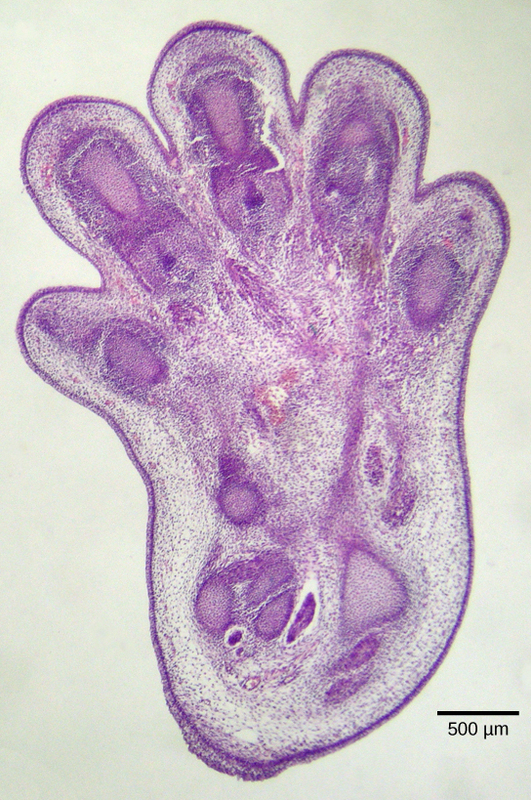 Programmed Cell Death: This histological section of a foot of a 15-day-old mouse embryo, visualized using light microscopy, reveals areas of tissue between the toes, which apoptosis will eliminate before the mouse reaches its full gestational age at 27 days. Apoptosis is also essential for normal embryological development. In vertebrates, for example, early stages of development include the formation of web-like tissue between individual fingers and toes. During the course of normal development, these unneeded cells must be eliminated, enabling fully separated fingers and toes to form. A cell signaling mechanism triggers apoptosis, which destroys the cells between the developing digits. Macroautophagy, often referred to as autophagy, is a type of programmed cell death accomplished through self-digestion. It is a catabolic process that results in the autophagosomic-lysosomal degradation of bulk cytoplasmic contents, abnormal protein aggregates, and excess or damaged organelles. Autophagy is generally activated by conditions of nutrient deprivation but has also been associated with physiological as well as pathological processes such as development, differentiation, neurodegenerative diseases, stress (physiology), infection and cancer. Necrosis is the death of a cell caused by external factors such as trauma or infection and occurs in several different forms. Recently a form of programmed necrosis, called necroptosis, has been recognized as an alternate form of PCD. It is hypothesized that necroptosis can serve as a cell-death backup to apoptosis when the apoptosis signaling is blocked by endogenous or exogenous factors, such as viruses or mutations.